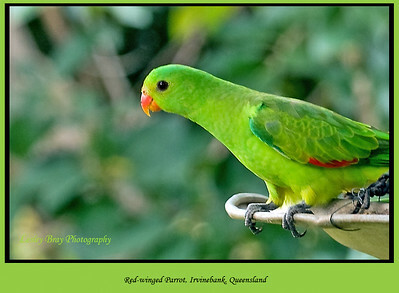 31 images - Rock Parrot, Red-rumped Parrot, Red-winged Parrot, Red-capped Parrot, Australian Ringneck, Regent Parrot, Elegant Parrot, Australian King-Parrot, Budgerigar. These photos are here for the enjoyment of others who may not have an opportunity to see a certain bird up close or to assist in identification of a bird they have seen. Click on the 'Info' icon to see the location in Australia these photos were taken. I only sell my photos under certain circumstances BUT I am happy to share them for digital purposes with permission. All photos are © Lesley Bray Photography. Do not remove my signature from image. Sharing only with credit please. 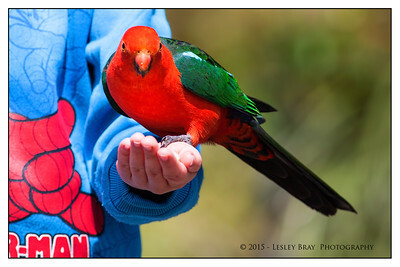 Photos may not be used for any purposes without the express written permission of Lesley Bray. 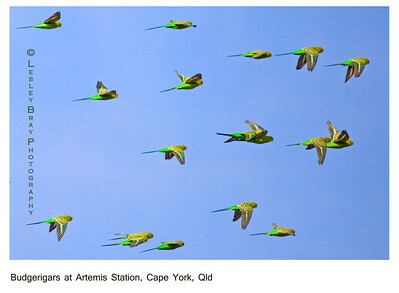 Budgerigars in flight, Melopsittacus undulatus, at Windmill Creek on Artemis Station south of Yarraden, Cape York, Queensland, Australia. Photographed October 2013 - © 2013 Lesley Bray Photography - All Rights Reserved. Do not remove my signature from this image. Sharing only with credit please. Sometimes you just have to shoot into the sun, especially when you see birds hundreds of kilometres out of their normal locality. 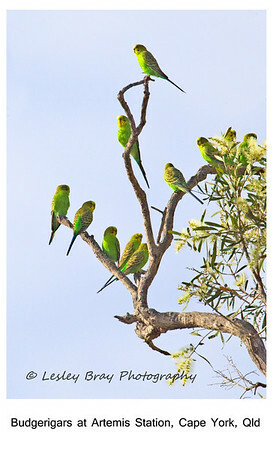 Budgerigars, Melopsittacus undulatus, at Windmill Creek on Artemis Station south of Yarraden, Cape York, Queensland, Australia. Photographed October 2013 - © 2013 Lesley Bray Photography - All Rights Reserved. Do not remove my signature from this image. Sharing only with credit please. I was quite pleased with this one, hand held from the car, with 70-200mm lens. It could be sharper but it is a small crop and it is what it is. 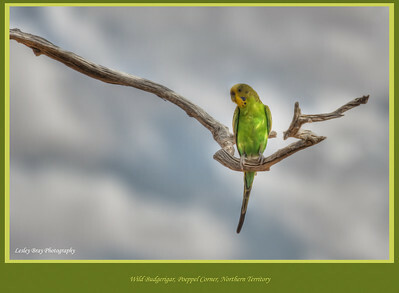 Nothing was cloned from this image, I was lucky to spot this budgie perching on a leafless branch in the Simpson Desert. Wild Budgerigar, Melopsittacus undulatus, in the Simpson Desert at Poeppel Corner, Northern Territory, Outback Australia. Photographed September 2010 - © 2010 Lesley Bray Photography - All Rights Reserved. Do not remove my signature from this image. Sharing only with credit please. 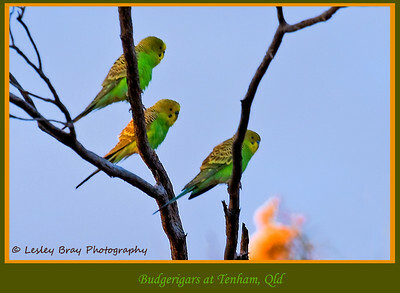 Three Budgerigars, Melopsittacus undulatus, in a tree at Tenham, West Queensland, Australia. Photographed August 2010 - © 2010 Lesley Bray Photography - All Rights Reserved Do not remove my signature from this image. Sharing only with credit please. 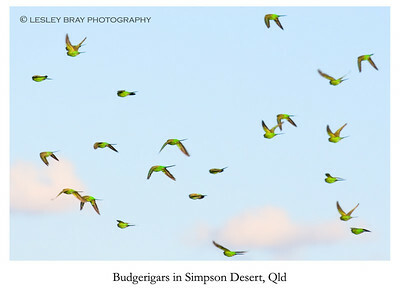 Flock of wild budgerigars, Melopsittacus undulatus, on the QAA Line in the Simpson Desert, Outback Queensland, Australia. Taken with a 200mm lens. Photographed August 2010 - © 2010 Lesley Bray Photography - All Rights Reserved. Do not remove my signature from this image. Sharing only with credit please. 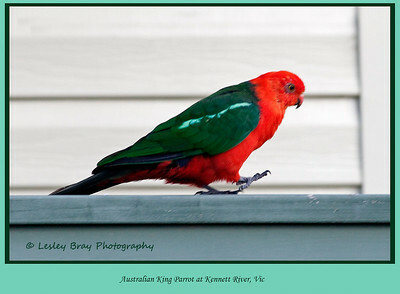 Male Australian King-Parrot, Alisterus scapularis, at Kennett River, Victoria, Australia. 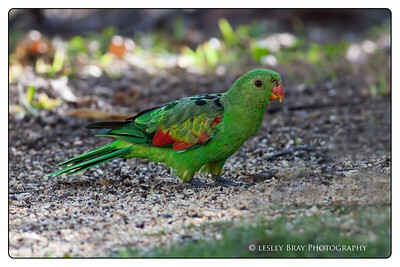 Photographed February 2012 - © 2012 Lesley Bray Photography - All Rights Reserved. Do not remove my signature from this image. Sharing only with credit please. 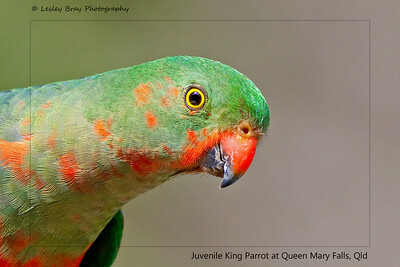 Curious juvenile male Australian King-Parrot, Alisterus scapularis, at Queen Mary Falls, Killarney, Queensland, Australia. Photographed December 2012 - © 2012 Lesley Bray Photography - All Rights Reserved. Do not remove my signature from this image. Sharing only with credit please. 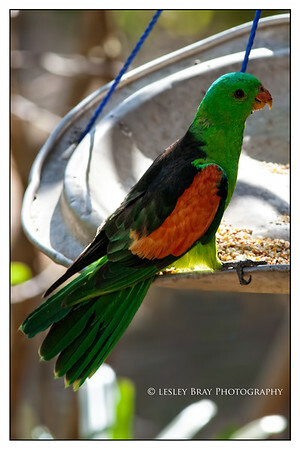 Daniel feeding a male King Parrot, Alisterus scapularis, at O'Reilly's Guesthouse, Canungra, Queensland, Australia. Photographed September 2015 - © 2015 Lesley Bray Photography - All Rights Reserved. Do not remove my signature from this image. Sharing only with credit please. 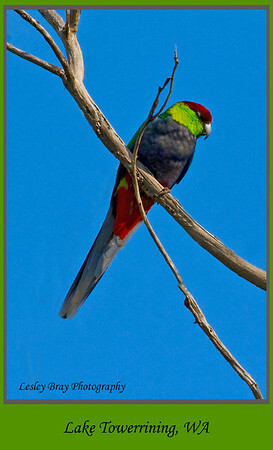 Australian Ringneck or Twenty-eight Parrot, Barnardius Zonarius, at Yanchep, Western Australia. Do not remove my signature from this image. Sharing only with credit please. 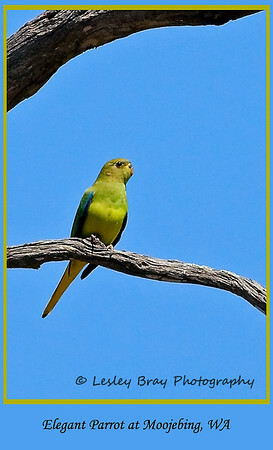 Australian Ringneck, Barnardius zonarius, at Broomehill Rest Area, Western Australia. Photographed December 2011 - © 2011 Lesley Bray Photography - All Rights Reserved Do not remove my signature from this image. Sharing only with credit please. 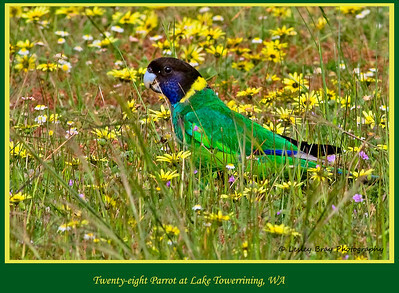 Australian Ringneck, Barnardius Zonarius, at Lake Towerrining, Western Australia. Photographed October 2011 - © 2011 Lesley Bray Photography - All Rights Reserved. Do not remove my signature from this image. Sharing only with credit please. 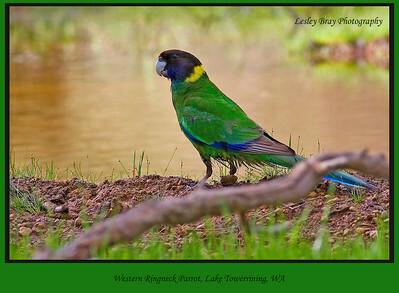 Australian Ringneck, Barnardius Zonarius, at Lake Towerrining, Western Australia. Photographed October 2011 - © 2011 Lesley Bray Photography - All Rights Reserved Do not remove my signature from this image. Sharing only with credit please. 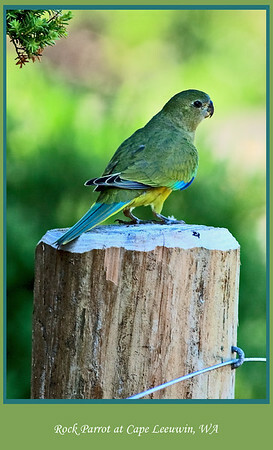 Australian Ringneck, Barnardius zonarius, at Bridgetown, Western Australia. Photographed November 2011 - © 2011 Lesley Bray Photography - All Rights Reserved. Do not remove my signature from this image. Sharing only with credit please. 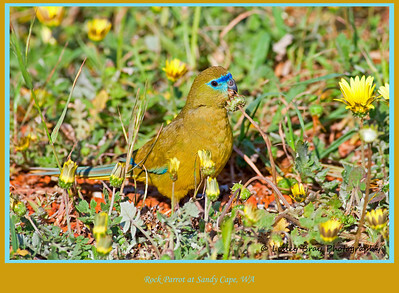 Rock Parrot, Neophema petrophila, at Sandy Cape Recreation Park, north of Jurien Bay, Western Australia. Photographed September 2011 - © 2011 Lesley Bray Photography - All Rights Reserved. Do not remove my signature from this image. Sharing only with credit please. 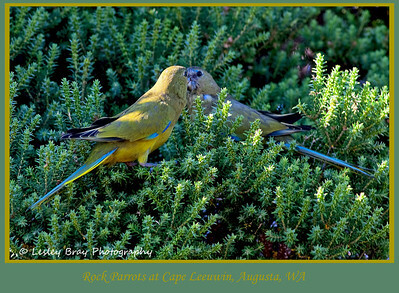 Rock Parrot, Neophema petrophila, at Cape Leeuwin, Augusta, Western Australia. Photographed January 2012 - © 2012 Lesley Bray Photography - All Rights Reserved. Do not remove my signature from this image. Sharing only with credit please. 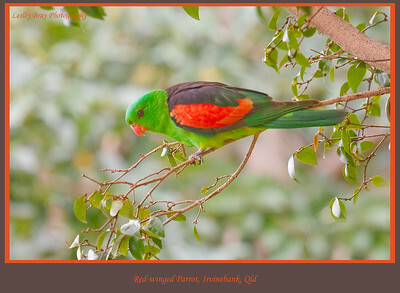 We saw this colourful male Red-winged Parrot, Aprosmictus erythropterus, at a friend's house in Irvinebank, in North Queensland. Photographed July 2010 - © 2010 Lesley Bray Photography - All Rights Reserved. Do not remove my signature from this image. Sharing only with credit please. How come the males are prettier than females? Red-winged Parrot, Aprosmictus erythropterus, at Irvinebank, Queensland, Australia Photographed July 2010 - © 2010 Lesley Bray Photography - All Rights Reserved. Do not remove my signature from this image. Sharing only with credit please. 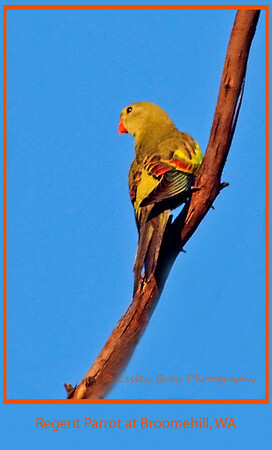 Female Red-winged Parrot, Aprosmictus erythropterus, at Irvinebank, Queensland, Australia. Photographed July 2010 - © 2010 Lesley Bray Photography - All Rights Reserved. Do not remove my signature from this image. Sharing only with credit please. 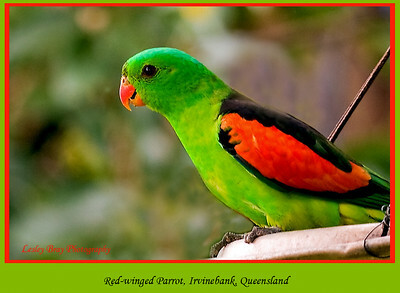 Red-winged Parrot, Aprosmictus erythropterus, at Irvinebank, Queensland, Australia. Photographed September 2014 - © 2014 Lesley Bray Photography - All Rights Reserved. Do not remove my signature from this image. Sharing only with credit please. 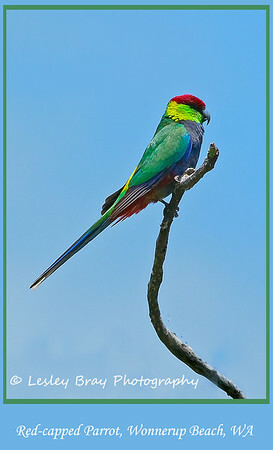 Male Red-capped Parrot, Purpureicephalus spurius, at Lake Towerrining, Western Australia. Photographed October 2011 - © 2011 Lesley Bray Photography - All Rights Reserved. Do not remove my signature from this image. Sharing only with credit please. 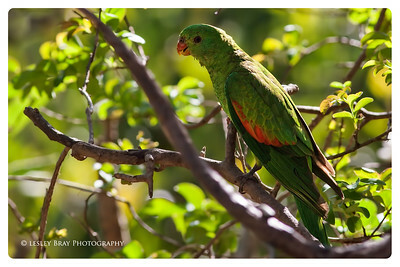 Red-capped Parrot, Purpureicephalus spurius, at Malbup Creek, Wonnerup Beach, Western Australia. Photographed November 2011 - © 2011 Lesley Bray Photography - All Rights Reserved.. Do not remove my signature from this image. Sharing only with credit please. 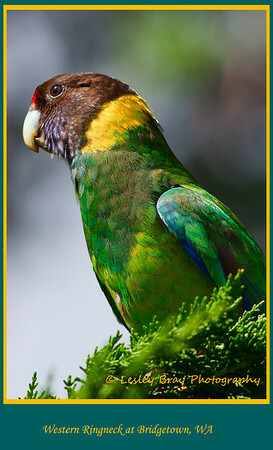 Was very lucky to find this bird - and equally lucky to capture a photo in the short time it hung around. 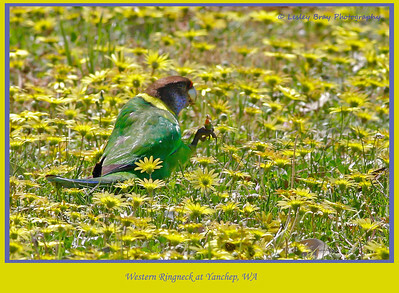 Female Regent Parrot, Polytelis anthopeplus, seen beside the road at Kendenup, Western Australia. Photographed December 2011 - © 2011 Lesley Bray Photography - All Rights Reserved. Do not remove my signature from this image. Sharing only with credit please. 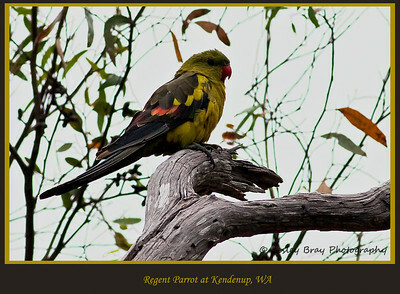 Regent Parrot, Polytelis anthopeplus, at Broomehill Rest Area, Western Australia. Photographed December 2011 - © 2011 Lesley Bray Photography - All Rights Reserved Do not remove my signature from this image. Sharing only with credit please. 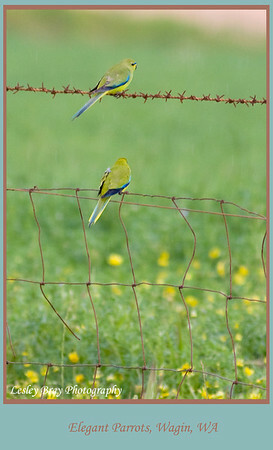 Elegant Parrots, Neophema elegans, sitting on a fence beside Bullock Hills Road, Wagin, Western Australia. Photographed September 2011 - © 2011 Lesley Bray Photography - All Rights Reserved. Do not remove my signature from this image. Sharing only with credit please. 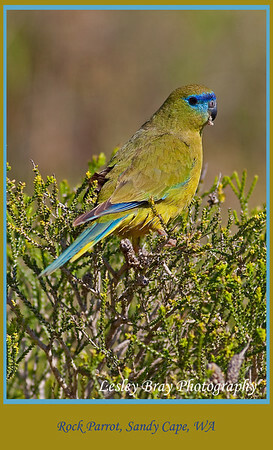 Elegant Parrot, Neophema elegans, at Moojebing, Western Australia. Photographed December 2011 - © 2011 Lesley Bray Photography - All Rights Reserved Do not remove my signature from this image. Sharing only with credit please. 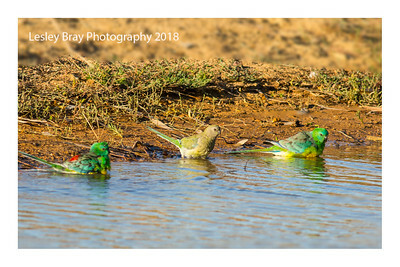 Red-rumped Parrots, Psephotus haematonotus, in a dam at Coco Bend, Moama, New South Wales. Photographed March 2018 - © 2018 Lesley Bray Photography - All Rights Reserved Do not remove my signature from this image. Sharing only with credit please. 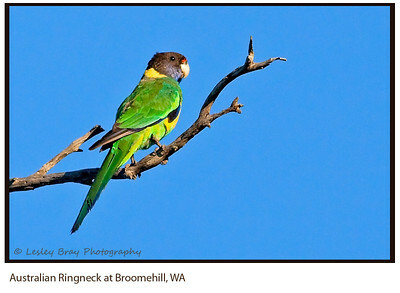 Australian Ringneck, Barnardius zonarius, at Broomehill Rest Area, Western Australia. Do not remove my signature from this image. Sharing only with credit please.